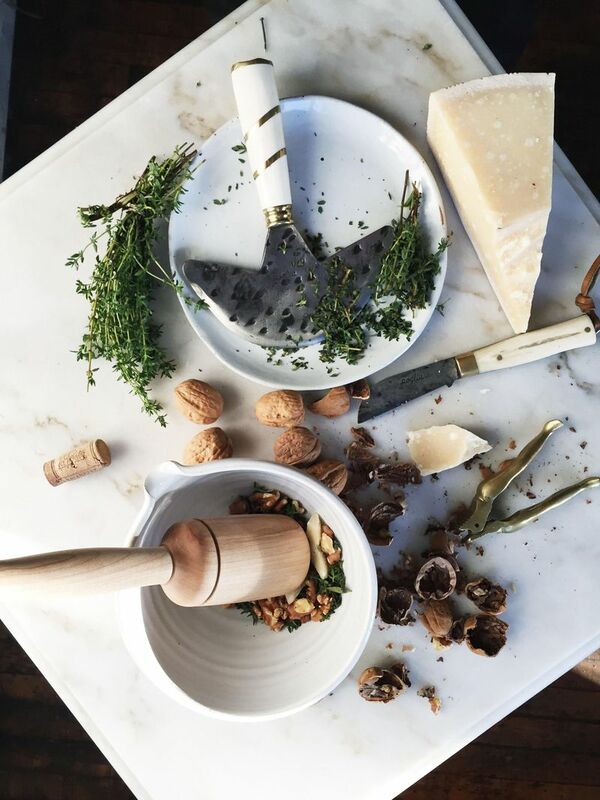 "The Buvette cookbook inspired me to make the walnut pesto," Max Poglia says in reference to the pictures he shot of our Dipped Stoneware Mortar & Pestle, shown below. 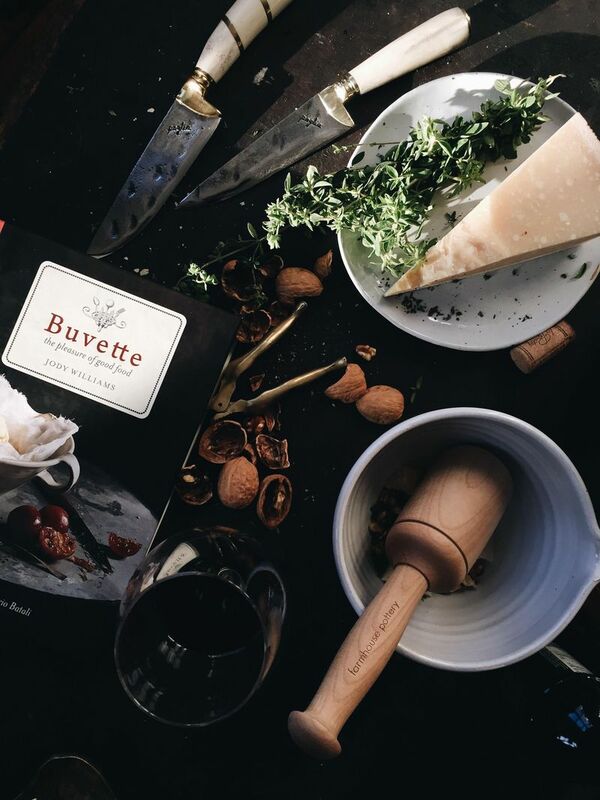 In 2011, Max worked with chef Jody Williams to design the "visual identity" for Buvette—including the design of the menus, their logo, their letterpress prints, and the like—and since then he's founded Poglia, a Brooklyn-based brand that specializes in handcrafted knives, leather bags, and loom-woven baskets. Because we love his style, we sent him a few of his favorite products from the Shop—the aforementioned mortar & pestle and a reclaimed wood knife grabber—so that we could watch him at work. One of his shots, styled on a slab of white marble much like the one we sell here is all glowy soft light (above, left), and the other, on a black surface and accompanied by the knives he makes and sells, is rightfully edgier—with slashes of late afternoon light and what must be a few fingers of cold scotch in the background (above ,right). 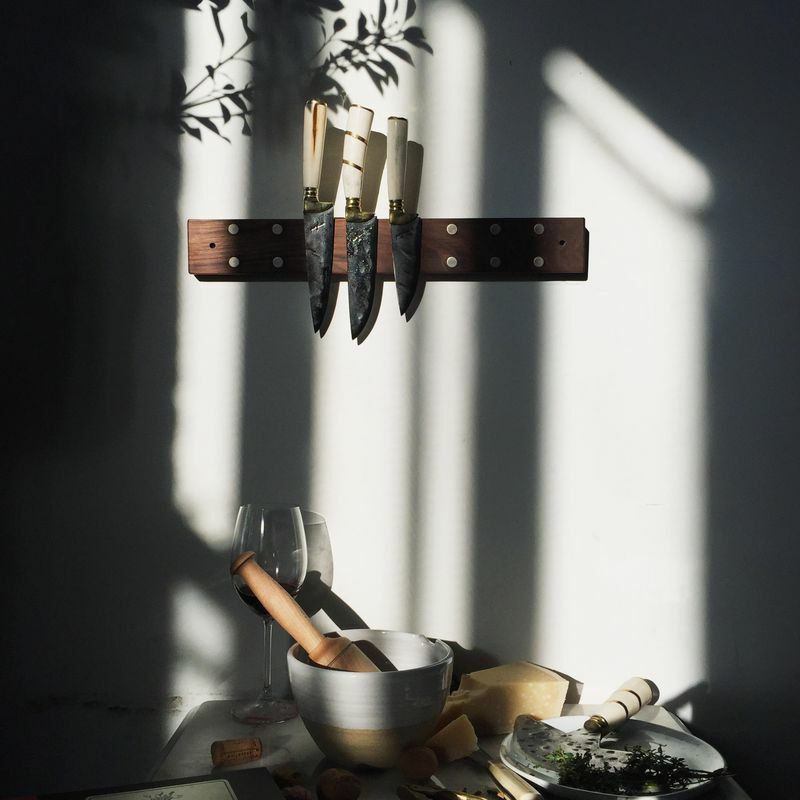 Being a knifemaker, Max was also interested in our Reclaimed Knife Grabber, the perfect place for storing all of his gorgeous blades—which he photographed in a beam of windowlight. His tips for taking sufficiently moody, Insta-worthy images? In general, I stick to using natural light—in my opinion, waiting for perfect natural light + a good background is key when shooting these kinds of things. I also tend to shoot things straight-on, from a level perspective, to keep my work consistent. Our Reclaimed Knife Grabber and Dipped Stoneware Mortar & Pestle, propped out with Max's beautiful knives. We love everything about his pictures, and especially that use of very real everyday light that it's shining through the window in stripey beams. All it's missing is a bowl of pasta for that pesto. Do you like the light background or the dark background for the overhead shot? Let us know in the comments!